All our Polish pottery Cookie Jars are handmade and hand painted. 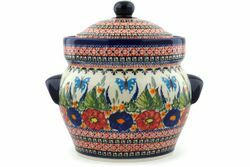 This cookie jar / canister is not only useful, but is sure to make a wonderful addition to your eclectic kitchen. The superior quality of Polish stoneware makes this canister perfect for every day use.